Attachment has been studied with children and more recently with adults. However, it is only now being considered in relation to the relationship between caregivers and people living with dementia. Whether you are a paid or unpaid caregiver for someone living with dementia you have an effect on the person, emotionally, psychologically. Because of the cognitive changes that cause such loss of confidence and increased confusion, the person with dementia often feels emotionally upset, lost, confused, angry, abandoned, forgotten. So they are more likely to sense themselves they way they did when they were younger, much younger – like 3-8 years old. They are not children but they can feel like they used to and this is where attachment comes in. You know yourself how easy it is to be thrown back into younger emotional territory by the actions of other people or your own actions that cause you to feel the way you used to when you were younger. Its much the same for the person with dementia. So you become their attachment figure in this emotional landscape. You are important from an emotional point of view because you become a provider of safety and security, predictability. They rely on you, look to you for guidance about what to do next, where to go, how to feel. I some ways you are a “mother” or “father” figure to the person. In a future blog I will talk about the ways in which disturbed behaviour can be understood as attachment behaviour. 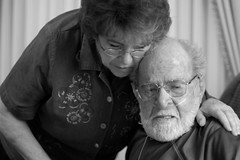 This entry was posted in dementia and tagged Attachment, caregivers by Bernie McCarthy. Bookmark the permalink.